A bracket fungus which grows on the sides of standing trees, often high up, but in this instance at just 2 feet high. Growing in overlapping brackets which are flattish but thick. The same colour as cooked chicken at the ends, with a similar texture, but often a darker orange or brown on top. The upper surface is suede-like and velvety, bright-yellow but becoming more orange with age. The margin is zoned. With an irregular semi-circular undulating and lumpy surface and somewhat in-curved margin. The texture is similar to cooked chicken. It becomes crumbly and inedible with age. Almost indistinguishable from Giant Polypore (Melipils giganteus (when that is young) this turns brown very quickly when injured unlike Chicken-of-the-Woods and older specimens of Giant Polypore have a brown top. Although Giant Polypore is edible, it is less sought after than Chicken-of-the-Woods because of the bruising to brown characteristic. Related to : Hen-of-the-Woods [a plant with similar name which also belongs to the same Coriolaceae Family, but is in a different Genus]. However, Chicken-of-the-Woods grows like a bracket on the side of deciduous trees (mainly Oak , hardly ever coniferous) whereas Hen-of-the-Woods grows on the ground (but on the roots of trees). It is edible when young, but like all polypores, of which it is one, it becomes tough and inedible when old. It has been known to cause allergic reactions. As well as having the same colour of cooked chicken, it has the texture as chicken meat and has been eaten as a substitute for chicken by vegetarians. The underside has small circular or oval pores which sometimes drip water. It is widespread throughout the UK and common. Hordenine is a Phenylethylamine not dissimilar to Dopamine. 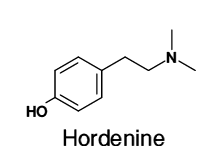 Hordenine exhibits anti-biotic and anti-bacterial properties and in mammals it stimulates the release of the hormone and neurotransmitter Noradrenaline (otherwise known as norepinephrine) which increases the heart-rate. Sprouting Barley seeds contain Hordenine in their roots as the main alkaloid. As an anti-biotic Hordenine has an inhibitory action on at least 18 strains of penicillin-resistant Staphylococcus bacteria. Hordenine is also produced by several cacti including the Peyote Cactus, and by some Acacia shrubs and trees. The fungus also contains Tyramine , 4-hydroxyphenylethylamine, a naturally occurring monoamine which is derived from the amino acid Tyrosine. 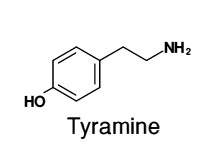 Tyramine acts as a catecholamine (such as Dopamine, Noradrenaline and Adrenaline ) releasing agent but one which cannot cross the blood-brain barrier, limiting its effects to the body rather than having any psychoactive effects. Tyramine is contained in a lot of differing foods, including most hard cheeses, beans and green beans, chocolate, alcoholic drinks, fruits such as bananas, pineapple, Raspberry, peanuts, coconuts, yeast, etc. 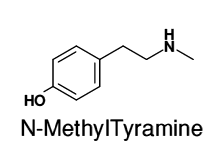 N-Methyltyramine is also found in plants such as Barley and Bitter Orange . It is yet another catecholamine releasing agent. It is a constituent of beer, which is made from malted Barley . Chicken-of-the-Woods is edible, but should never be eaten raw, only cooked. It can give some people an upset stomach or lead to dizziness because of the above phenylethylamine alkaloids that it contains. This is a toxic cyclodepsipeptide that is trimeric and possesses 120° rotational symmetry. At first sight it resembles a porphyrin skeleton, but that has 90° rotational symmetry and four five-membered rings. It is constructed from three residues of Methylphenylalanyl and three of Hydroxy-iso-valeryl . It is a mycotoxin with anti-biotic and insecticidal properties and is active against gram-positive bacteria and mycobacteria.. 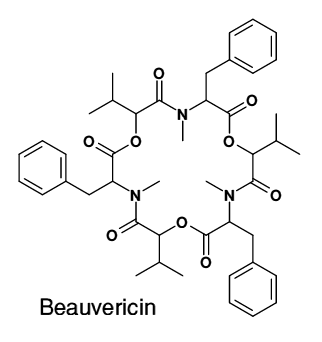 It was first found in the fungus Beauveria bassiana but is also found in many other fungi including sfusarium species, and as such should therefore also be found in Barley , Corn and Wheat . Like a Porphyrin it is able to form complexes with ions (using the nitrogen atom in the centre), and can transport both alkali metal ions and alkaline earth metal ions across cell membranes. It is also a specific cholesterol acyltransferase inhibitor which is considered toxic to human cells and can induce cell-death (apoptosis) and DNA fragmentation.